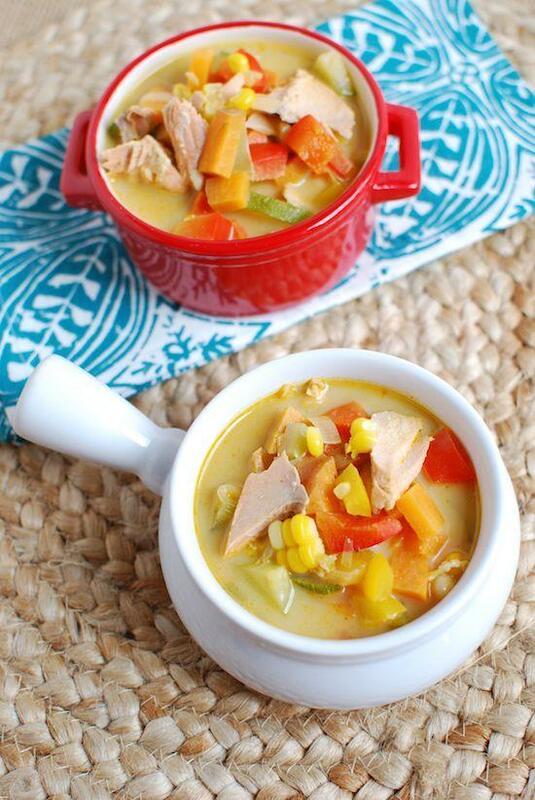 This Salmon Corn Chowder is a light, simple soup that’s packed with vegetables. Enjoy it for lunch or dinner even on a hot summer day. Anyways, I love making this recipe in the summer and when I noticed yesterday that I just so happened to have some salmon thawing in the fridge, plus lots of corn, I knew we were due for another batch. This recipe is the perfect way to use up all your favorite summer produce! I tend to use zucchini, carrots, peppers, celery, potatoes and corn but feel free to use whatever you have on hand! In a large Dutch oven, saute the vegetable (except the corn and zucchini if you’re using it) for 5-7 minutes. Add the broth, bring to a boil, then reduce heat and simmer until veggies reach desired tenderness. Stir in milk, salmon, corn & zucchini and heat through. Add seasonings, taste and adjust accordingly. Typically I used white potatoes, but sweet potato was all I had on hand this time. I use skim milk for this recipe, but if you want it to be more chowder-like, try 2% or whole. You can also add a little less broth and more milk to play with the ratio until you’re satisfied. I don’t put a ton of Old Bay in the large pot since it’s pretty high in sodium, but I do love to add a little sprinkle to each bowl as it’s served for more flavor! Wow, this looks and sounds amazing. Super simple too! I love salmon. Thanks for sharing! Fact: I cannot say “chowder” without a lame New England fake accent. LOL! Fabulous! So easy to make dairy free too with almond milk! Salmon, sweet potatoes and corn! Yes please! Although I will try with almond milk and see if it works- fingers crossed! Ooh my husband likes clam chowder…maybe he’d like this?! I’m always looking for new ways to cook salmon. 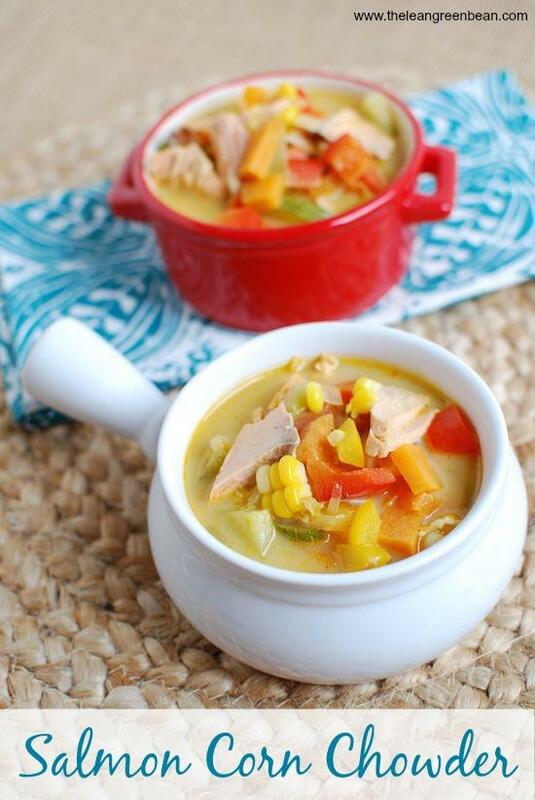 ok i LOVE corn chowder – must make this! pinned! Perfect blend of ingredients for summer soup! This makes me laugh – I think your post title was cute but I totally feel your pain from the first blog posts to now. haha right?! I had SO many corny post titles when i first started! 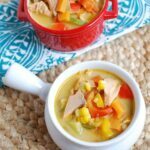 I love a good corn chowder and adding Salmon sounds so delicious. I can imagine the salty, briney flavor it would add–perfect with with sweet, snappy corn! Yum!! A summer must try! We have fresh Jersey corn coming into season very soon, looks like I will make your soup because we also love salmon (a great combo). YUM. What an easy recipe! The next time I have some leftover salmon I’ll remember this! yes! it’s perfect for leftovers! yes! or maybe add some tofu or beans or something! yum! I adore salmon, and eat it daily pretty much, but I always eat it the same way and forget that it tastes so flipping good in stews like this!!! 🙂 YUM ! For some reason, when I click on print, it is not printing the entire recipe. Boo. hmmm sorry about that. i’ll try to look into it! I love summer soups! This looks awesome! I’m always trying to find different ways to use salmon and this recipe is something that I would definitely like to try! Looks delicious and I like how it is so simple too! I usually grill my salmon only, and I love that you incorporated it in a chowder! it’s fun to change it up every once and a while! LOVE YOUR RECIPES, BUT WHEN I PRINT THE RECIPE I GET 21 PAGES OF COMMENTS FROM PEOPLE. I CAN READ THOSE, I DON’T NEED 21 PAGES, WASTE OF PRINT INK AND PAPER. .
if you choose the print button within the recipe card you should just get one page with only the recipe! [WORDPRESS HASHCASH] The comment’s server IP (108.167.133.35) doesn’t match the comment’s URL host IP (108.167.143.215) and so is spam.